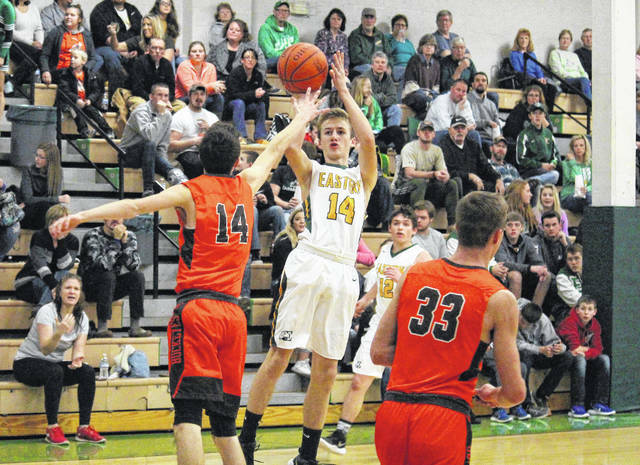 Eastern sophomore Colton Reynolds (center) pulls up for a jump shot, during the first half of the Eagles’ 55-34 victory over Nelsonville-York on Wednesday in Tuppers Plains, Ohio. Eastern junior Blaise Facemyer (12) shoots a layup in front of a trio of Buckeyes, during the Eagles’ 55-34 victory on Wednesday in Tuppers Plains, Ohio. TUPPERS PLAINS, Ohio — Control the glass, control the game. 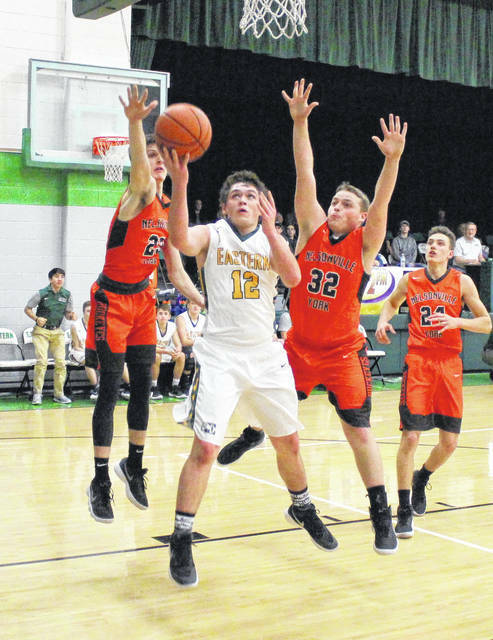 The Eastern boys basketball team won the rebounding battle by 22 on Wednesday in Meigs County, leading the Eagles to a 55-34 victory over non-conference guest Nelsonville-York. After a pair of early lead changes, the Eagles (3-4) took the lead for good with an 8-0 run that last 1:33. NYHS (4-4) closed the first quarter with a 5-3 spurt and trailed 14-10 at the end of the stanza. The Eagles pushed their lead to double digits in the second quarter, but settled for an eight-point, 33-25, halftime lead. The hosts allowed the Buckeyes to make just one field goal in the third quarter, as Eastern’s lead grew to 43-29 by the end of the third quarter. The Eagles led by as many as 24 points in the fourth, sealing the 55-34 victory with a with a 12-to-5 quarter. “The kids played hard and our post play was phenomenal,” said Eastern head coach Jeremy Hill. “We teach the kids that when you have a mismatch — and we’re going to have a mismatch in the post most nights with Kaleb Hill and Garrett Barringer — you have to feed that monster. Some of the kids figured that out and Kaleb Hill did a phenomenal job. As a team, the Eagles shot 24-of-43 (55.8 percent) from the field, including 2-of-6 (33.3 percent) from three-point range. Meanwhile, Nelsonville-York shot 9-of-43 (20.9 percent) from the field, including 4-of-16 (25 percent) from beyond the arc. At the charity stripe, EHS was 5-of-9 (55.6 percent) and NYHS was 12-of-23 (52.2 percent). The Eagles outrebounded the Buckeyes by a 39-to-17 clip, including 12-to-9 on the offensive end. 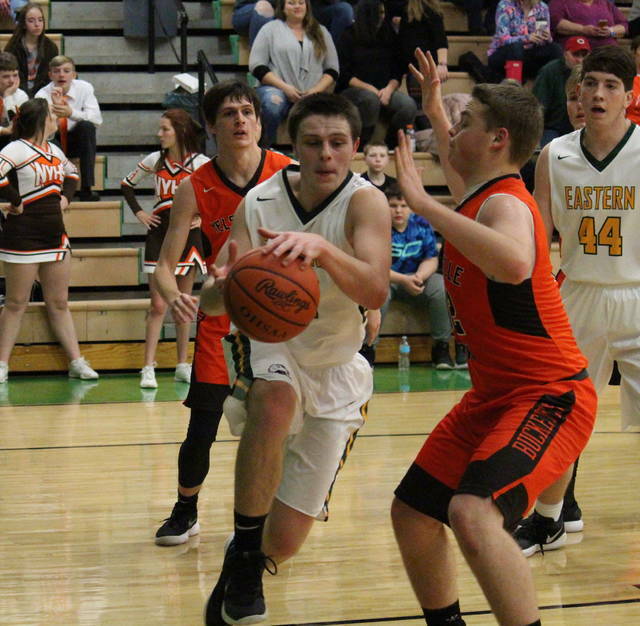 Eastern also claimed a 15-to-6 advantage in assists, while Nelsonville-York earned an 11-to-7 edge in steals. EHS committed 23 turnovers in the win, eight more than the Buckeyes. Both teams came up with a pair of blocked shots. EHS senior Kaleb Hill led the victors with 18 points on nine field goals. Garrett Barringer scored 12 points for the hosts, while Isaiah Fish earned a double-double of 10 points and 14 rebounds. Colton Reynolds and Blaise Facemyer each hit a three-pointer and finished with eight and seven points respectively. Blaise Facemyer led EHS with five assists, while pulling in nine rebounds. Fish, Reynolds and Ryan Dill came up with two steals apiece for the Eagles, while Hill rejected two shots. Justin Perry led the Buckeyes with 11 points, all of which came in the second quarter. 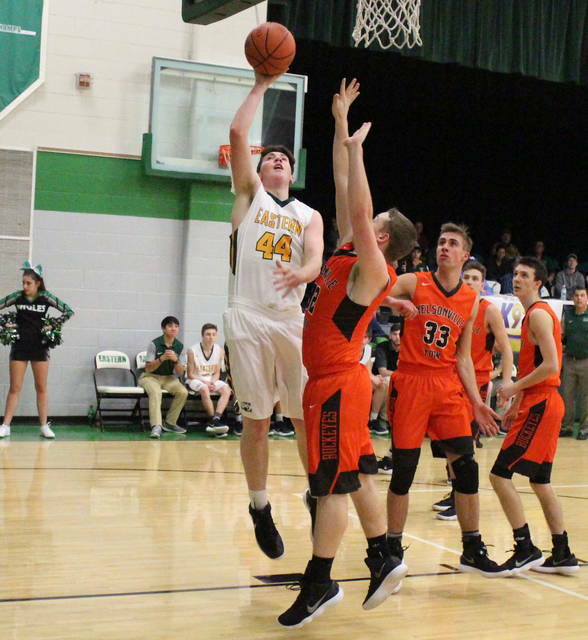 Reece Robson marked nine points in the setback, while Ethan Bohyer recorded six points and six rebounds. Mikey Seel scored four points for the Orange and Brown, Ethan Gail chipped in with three, while Brayden Allen added one. Seel and Perry led the guests with two assists apiece, while Bohyer, Gail and Jonathan Richards had two steals apiece. Allen and Robson each blocked a shot for NYHS. The Eagles and Buckeyes won’t meet again this season. The win ends Eastern’s two-game losing skid, as well as halting the Nelsonville-York’s two-game winning streak. Eastern will finish its three-game home stand on Friday against Southern.